The legendary Dikembe Mutombo (whose full name was unbelievably Dikembe Mutombo Mpolondo Mukamba Jean-Jacques Wamutombo) was a star on the basketball court playing for the Houston Rockets. Due to his immense size and great defensive play he is known as one of the best shot blockers in NBA history. 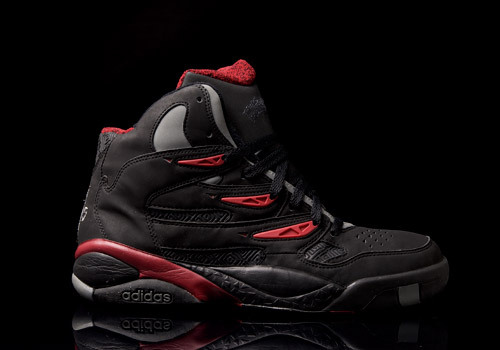 It’s no surprise why adidas would create not one, but multiple shoes for Mutombo, eventually releasing this adidas Mutombo 2 in 1993. An all black synthetic upper gives this vintage silhouette a heavy feel that is complimented by the solid weight of the rubber outsole. 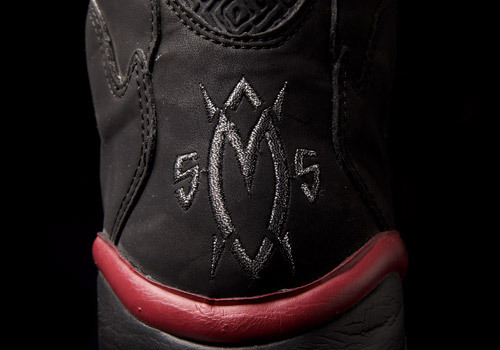 The black on black patterning that is iconic of Mutombo’s shoes and apparel can be found on the sides and upper heel area. 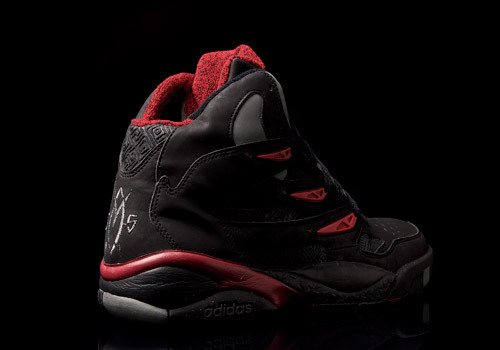 Bits of dark grey and two shades of red accent the mostly black colorway, especially in the unique side stripe eyestays and midsole. 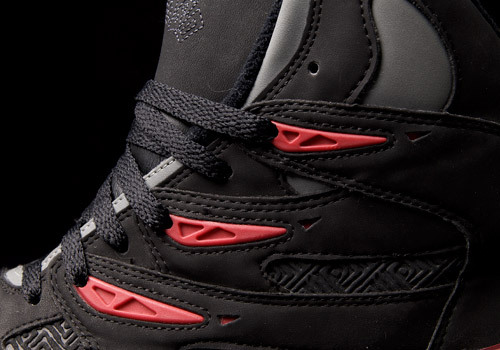 His logo is embroidered in silver lining on the lower heel and the sockliner and inner tongue are exquisitely decorated with a soft black and red padding that makes the shoe extremely comfortable to wear, providing long lasting support. 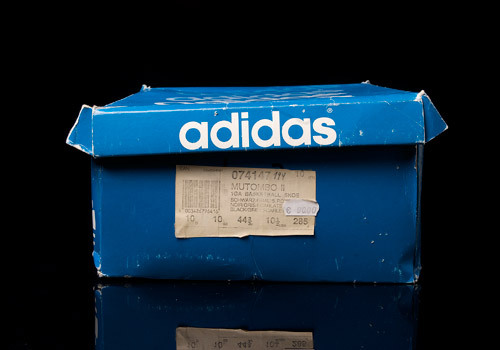 This shoe has further design features that make it a unique release among adidas Originals’ long line of classic and vintage silhouettes, such as a large wide tongue – which acts as a reminder of serious old school trainers – and the hollow loops behind the upper eyestays on the inner sides of both shoes. 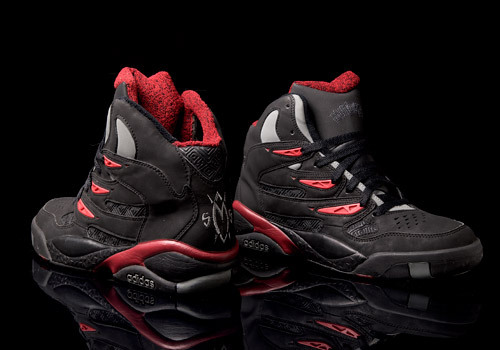 The hard, thick, firm outsoles provide the pair with some serious weight and they even click as one walks, giving the impression that these were sturdy work boots, and not basketball shoes. 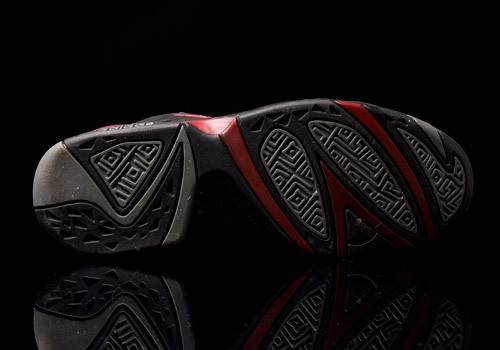 The toe box itself is very reinforced and provides great support for long term wear, as well as tension and pivoting in the forefoot. Packaged in a royal blue vintage style shoebox, the kicks come with black laces and represent a memory that Dikembe Mutombo left on the court until his retirement in 2009.